This pub is included as one of the entries in the Londonist Book of Pub Crawls. 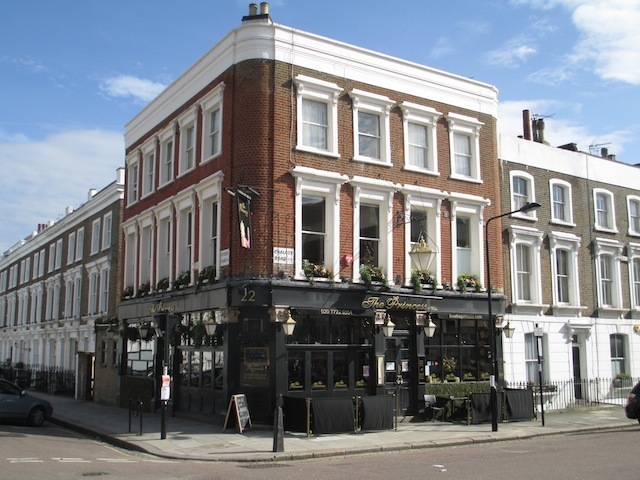 Named not for the ‘Gawd bless ‘er, she was the queen of all our hearts’ Diana, but her predecessor Alexandra, wife of Edward VII, this quaint old corner pub is, in our humble opinion, the best in Primrose Hill. The main room offers a torus of tables arranged around the well-stocked bar, with extra seating outside during fine weather. It was refurbished in 2012, and looks all the brighter for it — especially the smart function room upstairs. Head down the precarious stairs and you’ll find another seating area that always has free tables, and a surprising basement beer garden. 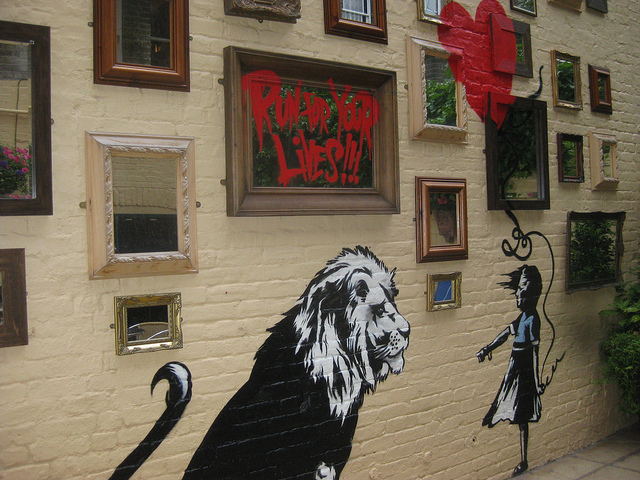 The latter hit the news a while back when a suspected Banksy mural appeared overnight (it’s clearly a fake, however). More graffiti upstairs in the gents lavatory, where a number of doodlers have appended humorous speech bubbles to the horsey characters on the wallpaper. Genius. The draught beer choice is limited but unusual. On our most recent visit, they were pouring two ales from the tiny By The Horns brewery, who are based in a lock-up on a Tooting industrial estate. The pub's stock of bottled beers is much more varied. Sumptuous food options, a good wine choice, and an above-average cocktail list at £7 a go all make this a place to linger. A fake Banksy in the beer garden.